The Arcipelago de La Maddalena is a key area in the Mediterranean for all forms of marine life, but the area on land is equally important.Low lying Mediterranean shrubs and bushes such as mastic trees, wild olive trees, myrtle, lavender, broom and rosemary give the area its characteristic perfume. The 50 native plant species in these islands make up 25% of the native species in all of Sardinia. The nearby island of Spargi has different types of plants like Mediterranean oaks, and arbutus berry trees while Caprera has pine trees. The area’s sandy beaches bloom with sea roses, sand lilies and helichrysum plants.The strong tides and currents that rush through the Bocche di Bonifacio and the area’s irregularly shaped granite seabed create the perfect environment for varied and abundant sea life. The local sandbars are especially interesting from a naturalistic point of view with their large fans of red violescent sea-whips and yellow cluster anemones (Parazoanthus axinellae,) in the grottoes. There are also several species of pillow corals including Cladocora caespitosa, bryozoans like Myriapora truncata, also called fool’s coral because it looks like red coral, and Sertella septentrionalis. Between the cracks in the rocks you can find large crustaceans such as lesser slipper lobsters (Scyllarides arctus) mantis shrimps (S. latus), hermit crabs and lobsters.Among the fish species there are stable colonies of groupers, conger fish, croaker fish and moray eels. Migrant species such as amberjacks and small tuna can also be found.When sailing around these islands it’s not uncommon to spot bottlenose dolphins, stenellas and common dolphins. Another interesting natural phenomena are the “sidewalks” that can be seen on the seaside rocks where red Lithophyllum lichenoides algae form frames that can be up to a metre wide. In some areas you can still find rare large patellas (Patella ferruginea,) true sentinels of clean water.For those who like to scuba dive, the sandbars off the islands of Spargi, Spargiotto, Budelli and Caprera offer several underwater archaeological sites that are interesting to explore. 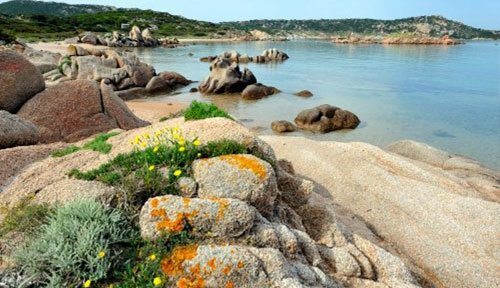 Created in 1996, the Arcipelago de La Maddalena Marine Protected Area is along Sardinia’s northwest coast off Palau and the Bocche di Bonifacio. It includes the islands La Maddalena, Caprera, S. Stefano, Spargi, S. Maria, Budelli and Razzoli and the water, partially submerged rocks and smaller islands around them. The park extends for over 15.000 hectares underwater. The entire archipelago is a protected environment because it has a very important ecosystem of sandy beaches, islands, dunes and wetlands that are the habitat of rare plants and animal species. This special park’s rules foresee areas that are entirely protected and off limits called MA that are signalled by red buoys and areas called MB that are protected for the most part and are signalled by diamond shaped yellow buoys. The waters in front of the beaches are delineated by round yellow buoys mounted on cables. You may not tie up to these buoys and you can only enter these areas rowing. You may only access the beaches using the access routes that run perpendicular to the water and you can only stay as long as it takes to disembark passengers and their belongings. S.Maria, Budelli and Razzoli are in the middle of the Bocche. They are lined up so close to each other that it is difficult to see where one ends and the other begins. Together they form the fjord of Porto Madonna (also called Cala G. Marino.) This area is well protected from winds and there is an area with mooring buoys. A spot that can’t be missed is Cala S. Maria, on the eastern side of the island by the same name, where there is a long white sandy beach. Before going there you should take a swim off the islands called Piana and Corcelli, which are wild and beautiful. We suggest using a buoy rope because metal anchors can easily get stuck on the rocky seabed. Continuing south, you sail past the granite island of Budelli, famous for the Spiaggia Rosa, or Pink Beach, whose sand is made of fragments of bryozoans and shells such as Miriapora truncata and Miniacina miniacea that have been deposited by the currents over the millennia. From there it’s on to Spargi. This island is off by itself and has a round, almost truncated shape. Here you’ll find beautiful spots such as Cala Granara and Cala dell’Amore and the famous Cala Corsara. After Spargi, it’s on to La Maddalena, the largest of this archipelago’s islands. The northern shore is a high rock palisade that has been carved out by the elements. To the east, where the Moneta bridge joins La Maddalena to Caprera, the coastline is lower, but to the west the coastline is high with some dunes where the granite cliffs are crumbling. All around the island there are inlets where you can swim: from the white dunes with very fine sand in Bassa Trinita, to the small fjord in Stagno Torto, to the splendid Cala Spalmatore where you can sleep overnight, to the tiny Cala Napoletana, on the northern side of the island towards the small marina in Porto Massimo. Entering the Cala Gavetta port, where you’ll find a small town, is tricky because of a series of sandbars. While the sandbars are all signalled, it’s best to arrive by day. If you rent a motor scooter you can explore the island from Marina di Guardia Vecchia to the Museo Nino Lamboglia with its roman artefacts. 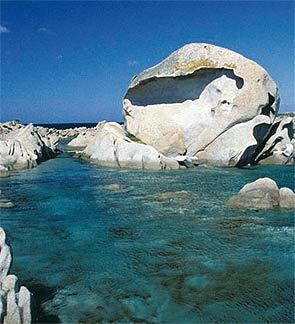 Nearby Caprera, with its huge granite boulders, is famous the world over for being the island that Garibaldi retired to. Along the eastern coast you’ll find beautiful spots like Cala Coticcio, also called Tahiti, and the wide gulf called Cala Portese. Created in 1996, the Park includes both the land and the water around the islands La Maddalena, Caprera, S. Stefano, Spargi, S. Maria, Budelli and Razzoli. It extends for over 15.000 hectares underwater. The archipelago is along Sardinia’s northwest coast off Palau and theBocche di Bonifacio. The seven larger islands are surrounded by partially submerged rocks and smaller islands.The entire archipelago is a protected environment because its very important and diverse ecosystems: sandy beaches, islands, dunes and wetlands are the habitat of rare plant and animal species.This special park’s rules foresee areas that are entirely protected and off limits called MA that are signalled by red buoys and areas that are mostly protected called MB that are signalled by diamond shaped yellow buoys. The waters in front of the beaches are delineated by round yellow buoys mounted on cables. You may not tie up to these buoys and you can only enter these areas rowing. You may only access the beaches using the access routes that run perpendicular to the water and you can only stay as long as it takes to disembark passengers and their belongings. In the MA area between the islands Razzoli and Santa Maria-La Presa it is forbidden to drop anchor; in the area between Nibani, Mortorio and Spargiotto you may not navigate, stop, drop anchor or fish. In the MB area around the Spiaggia Rosa (Budelli) you may not stop, drop anchor or fish; within the area delineated by the round yellow buoys (70m from the beach) you may not swim or walk on the beach. You may sail and moor at Cala G. Marino but you may not drop anchor. You may navigate through Passo Cecca di Morto but only if you have less than 80 cm draft. You may not navigate through Passo del Topo and Passo degli Asinelli. 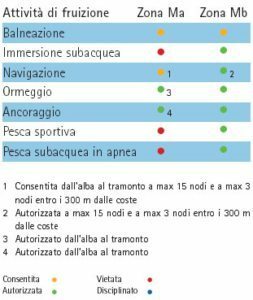 All of the above areas are delineated by buoys with adhesives that clearly state that they are prohibited areas. Within the delineated areas with red buoys you may not drop anchor. You may not capture or otherwise fish crustaceans, groupers, corvina fish, patella ferruginea or pinna nobilis fan mussels. Istituito nel 1996, il Parco tutela sia a terra che a mare le isole di La Maddalena, Caprera, S. Stefano, Spargi, S. Maria, Budelli e Razzoli, per oltre 15.000 ettari di fondali e mare protetto. L’arcipelago si estende lungo la costa nord-orientale della Sardegna, di fronte alla rada di Palau e alle Bocche di Bonifacio. Le sette isole maggiori sono circondate da una miriade di isolotti e scogli minori. L’intero arcipelago è protetto poiché ospita un ambiente ecologico di grande importanza, caratterizzato da spiagge, isole, dune, zone umide e paludi che ospitano specie rare animali e vegetali, sia terrestri che marine. La regolamentazione del Parco vigente è particolare, e prevede zone di protezione integrale (Ma), delimitate con boe rosse, e di protezione generale (Mb), delimitate con boe biconiche gialle. Gli specchi d’acqua antistanti le spiagge sono delimitati da cavi tarozzati costituiti da boe sferiche di colore giallo, alle quali è vietato ormeggiare, e vi è consentito esclusivamente l’accesso a remi. L’accesso agli arenili è consentito utilizzando le corsie di atterraggio poste perpendicolarmente alla costa e per il tempo necessario allo sbarco di persone e cose. S. Maria, Budelli e Razzoli sorgono al centro delle Bocche. Sono disposte una di fronte all’altra, così vicine da non riuscire a distinguerle, e formano il lungo fiordo di Porto Madonna (o Cala G. Marino), ben protetto dai venti dominanti. Qui c’è un campo di gavitelli. Un ancoraggio da non mancare è senz’altro Cala S. Maria, sul versante orientale dell’isola omonima, dove si può sostare davanti ad una lunga spiaggia chiara. Prima di giungervi si fare un bagno fra gli scogli di isola Piana e Corcelli, che offrono uno scorcio selvaggio di superba bellezza. È meglio filare un grippiale perché è facile incagliare il ferro sul fondale. Proseguendo verso sud si costeggia l’Isola di Budelli, completamente costituita di granito e celebre per la Spiaggia Rosa, formata da frammenti calcarei di briozoi e foraminiferi depositati sul litorale dalle correnti. Poi è la volta di Spargi; situata in una posizione appartata, si distingue per l’aspetto tozzo e quasi circolare. Qui si trovano alcuni “gioielli”, come le cale Granara e dell’Amore e la notissima Cala Corsara. La Maddalena è l’isola maggiore. Il versante settentrionale si presenta come un bastione di roccia profondamente inciso dagli elementi. A levante, dove il ponte della Moneta la congiunge con Caprera, è relativamente dolce; mentre ad occidente le alte coste sono interrotte dalle belle dune dovute allo sbriciolamento dei graniti. Il periplo è un continuo rincorrersi di cale dove fare il bagno, dalle bianche dune di sabbia finissima di Bassa Trinita, al piccolo fiordo di Stagno Torto, dalle splendide Cala Spalmatore, dove si può tranquillamente passare la notte, alla minuscola, rilucente, Cala Napoletana, sul versante nord, vicino al piccolo marina di Porto Massimo. L’atterraggio al porticciolo di Cala Gavetta, dove sorge l’abitato, è complicato da una serie di secche e relativi segnalamenti disseminati per la rada antistante, per cui è bene arrivare con la luce. Noleggiando un motorino si possono esplorare gli interni, dalla postazione della Marina di Guardia Vecchia, al Museo Nino Lamboglia che custodisce relitti romani. La vicina Caprera, nota in tutto il mondo per essere stata l’isola di Garibaldi, è in gran parte percorsa da imponenti rilievi granitici. Lungo la costa orientale si trovano le cale più belle fra cui spicca Cala Coticcio, nota come Tahiti, e l’ampio golfo di Cala Portese. Nella zona Ma compresa tra le isole di Razzoli e Santa Maria-La Presa è vietato l’ancoraggio; in quella di Nibani, Mortorio e Spargiotto sono vietati navigazione, sosta, pesca sportiva e ancoraggio. Nella zona Mb della Spiaggia Rosa, a Budelli, sono vietati sosta, ancoraggio e pesca sportiva; entro la linea delle boe sferiche gialle (a 70 m dalla spiaggia), è vietata la balneazione e il calpestio dell’arenile. A Cala G. Marino sono consentiti navigazione e ormeggio, mentre è vietato l’ancoraggio. Il Passo Cecca di Morto è navigabile per i soli natanti con pescaggio inferiore agli 80 cm. Nei tratti di mare di Passo del Topo e Passo degli Asinelli è vietato il transito. Tutti gli specchi acquei descritti sono delimitati da boe provviste di bande adesive indicanti il divieto. All’interno dei campi boe, segnalati con boe sferiche di colore rosso, è vietato l’ancoraggio. Sono infine vietati la cattura o il prelievo di crostacei e di esemplari di cernia, corvina, Patella ferruginea e Pinna nobilis.